Ili kufikisha huduma yangu ya mafunzo ya sauti bila gharama, nilitengeneza na kupandisha program za mafunzo Joett Vocal Drills Volume. 1-7 Mkito. Pamoja na hayo, kwa baadhi yenu kujifunzia na program hizo bado mnakua mnahitaji muongozo. Nilichokifanya ni kuwapandishia video za darasani mwangu mara kwa mara kwenye Instagram yangu @joettmusic ili muweze kuona mifano, na vile vile kuna video nyingi tu kwenye channel yangu ya YouTube. Na sasa nimeamua kufungua darasa kwa mafunzo ya lisaa limoja tu ndani ya studio yangu, ili kuwasaidia wale wanaotaka kukaa darasani na mimi kwa lisaa limoja tu, waweze kupata uelewa zaidi wa jinsi ya kufanya haya mazoezi ili wapate mafanikio ya haraka zaidi. Huduma hii inaanza mara moja. Kama ungependa kujiunga, tafadhali nitumie ujumbe WhatsApp nikupe utaratibu. Je, ungependa kusoma Nakala Nyeti za Mazoezi na Maelekezo ya Uimbaji Bora? Bofya hapa! 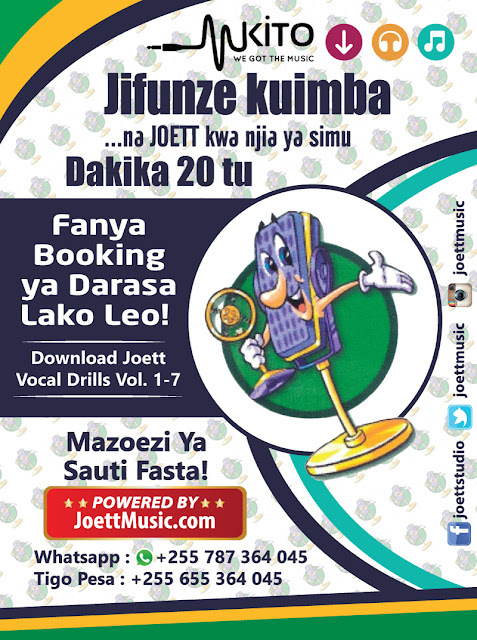 Mazoezi yangu ya sauti, yaani Joett Vocal Drills Vol. 1-4 yana madhumuni moja tu. Kuondoa tabia ya kupiga makelele na kuimbia kooni. Kwa maana nyingine, kama wewe unaimbia kooni na unapata shida kupanda na kushuka na vile vile unaumia unapo imba nyimbo, basi maana yake ni kwamba wewe hauna mpangilio stahiki wa kuimba. Hivyo basi, unahitaji kufanya mazoezi stahiki ya sauti ili kurekebisha sauti yako uweze kuimba kwa kutumia mfumo mpya, ambao hauumizi koo wala hauchoshi sauti yako. Na juu ya hapo, mfumo huu wa mazoezi ya kuimba utakuwezesha wewe kuimba kwa upeo mkubwa na kwa urahisi kabisa. Ukisha download Vol. 1-7 ntahitaji kusikia voice note yako ukiyafanya mazoezi ili nikupe muongozo zaidi. Usifanye Vol. 5-7 mpaka sauti imekaa sawa na mazoezi ya Vol. 1-4. Jipe muda wa wiki kadhaa. Usilazimishe notes na wala usiimbie kooni katika training. Na tafadhali fuata piano na uimbe ndani ya funguo (key). Nenda Instagram @joettmusic au #JaphyRoss uangalie video za Japhy Ross darasani. Itakupa uelewa zaidi. Sasa basi, kama unafanya mazoezi ya Vol. 1-4 na unashindwa kuenda na funguo (key) bila ya kupiga kelelele na kujiumiza koo, basi ujue unakosea. Wacha mazoezi mara moja alafu niombe mimi ushauri kupitia WhatsApp (namba ipo kwenye bango hapo juu). ONYO: Ukiendelea kubamiza sauti, utaua kabisa sauti yako. KUMBUKA: Mifano ya jinsi ya kufanya mazoezi kifasaha na bila shida yeyote wala kutumia nguvu, yapo kwenye ukurasa wangu wa Facebook @joettstudio na vile vile kwenye YouTube Channel yangu. Tafadhali Soma Nakala Nyeti za Mazoezi na Maelekezo ya Uimbaji Bora. Na kama ungependa nikuweke sawa, natoa madarasa ya lisaa limoja ana kwa ana ndani ya studio yangu, Oysterbay. Kwa maelekezo zaidi, bofya hapa! I have been running free voice assessments all along, but I think this time around I’ve gotten just a little louder about it... of sorts, what with Instagram configured artwork in a variety of shades created especially. 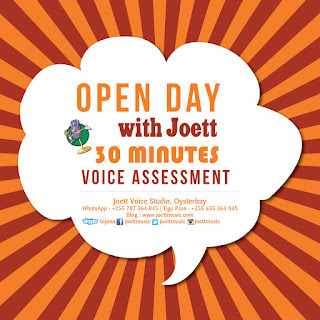 But here’s what the free voice assessments are all about. 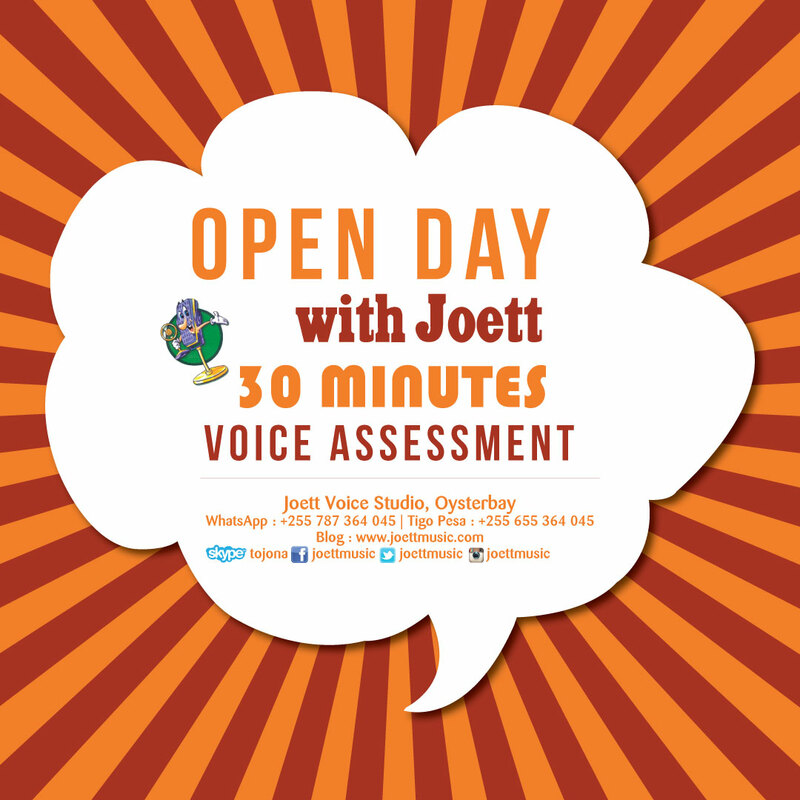 The reason for the assessments from the get-go was to get to assess new pupils before I accept them for my vocal training course. I basically wanted to hear the voice; run them through a breathing exercise; and then some scales on piano to establish whether or not they're able to work with music. (In all honesty, I wouldn’t want to admit someone who is tone deaf... for example). If they qualified, I would pencil them into my weekly vocal training schedule. That is primarily the purpose of this exercise. 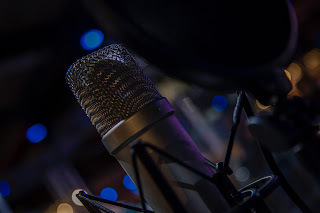 However, since creating and availing my training programs for download on Mkito, pupils all around the country now have access to my training modules and from time to time would request for in-studio vocal training sessions with me. Well, here’s where, again, the free assessments come in to play. But with a slight twist this time around, as this tends to attract mainly, pupils who have already downloaded my vocal training programs, but want a one-on-one consultation nonetheless, just to be sure of what they’re doing... which can be done over the phone or by sending me voice notes via WhatsApp. If you’re in the latter group, my recommendation is that at the very least, you take my Quick Start 3 Hour Course (TZS 90,000) so that you get to LEARN something. And I will give you a recording of your sessions with me (the good runs), so you can continue to practice at home. It’s a very small investment to a comprehensive long-term home learning program thereafter. Think about it! I hope you've enjoyed this post today, and I thank you for visiting. I have ALWAYS wanted an opportunity to write on how music is SO damned universal, that when UK Top 40 Singles Chart topper Despacito (Remix) (feat. 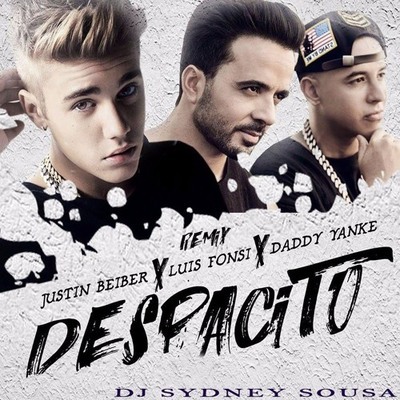 Daddy Yankee & Justin Bieber) by Luis Fonsi came along and I was preparing to begin reviewing the weekly chart for my blog, I just had to go grab it! I must admit, when I first heard the song on BBC Radio One a couple of weeks ago, I was immediately drawn to it. The song is SO catchy. It didn’t surprise me at all when in the following week Despacito remained at number one after being 12 weeks in the UK chart. The song is the first mostly Spanish language top 10 since "Macarena" in 1996-97. "This is great for Latin music!" Fonsi told Billboard, where it also graced the #1 position in the singles chart that same week. Driven by a new remix featuring Justin Bieber, for the first time in more than 20 years a mostly Spanish-language song ranks in the top 10 of the Billboard Hot 100. But what is SO refreshing about this particular song is that it sounds REALLY good. A good song transcends language, by all means, confirming yet again, that good music is good music, and that language is absolutely irrelevant. Bieber, meanwhile, doubles his longest Hot 100 Billboard reign. Of his four prior No. 1s, he had ruled the longest with "Sorry," for three weeks in early 2016. The rest of the tracks in the UK Top 40 Singles Chart are also ‘good music’ across the board, with Ariana Grande’s soaring vocals in One More Time at #2; and the utterly infectious Unforgettable (feat. Swae Lee) by French Montana at #3; and at number 4 Strip That Down (feat. Quavo) by Liam Payne adding a more quirky R&B vibe which I quite like; and brand new entry 2U (feat. Justin Bieber) by David Guetta breaks into the chart in the number 5 position; with the rest of the Top 10 looking like this: #6 Mama (feat. William Singe) - Jonas Blue; #7 I'm The One (feat. Justin Bieber, Quavo, Chance the Rapper & Lil Wayne) - DJ Khaled; #8 There's Nothing Holdin' Me Back - Shawn Mendes; #9 Slow Hands- Niall Horan; #10 Attention - Charlie Puth. With such good music being released at the moment, overall, the UK Chart Show is sounding better and better week on week. That being said, I couldn’t help but mention how utterly insane I am for up-tempo old-school-esq vibe That's What I Like by Bruno Mars, sitting at #27 this week… mind you, it’s been in the UK Top 4o Singles Chart for 19 weeks. Meanwhile, Stateside, Bruno Mars' "That's What I Like" drops 2-3 on the Hot 100, following six weeks at No. 2 after it topped the May 13-dated chart. Still, it paces Radio Songs for a seventh week, with 154 million in audience (down 7 percent), tying his longest command as a lead artist with "Just the Way You Are" (2010) and "Locked Out of Heaven" (2013); he's led longer only as featured on Mark Ronson's "Uptown Funk!" (12 weeks, 2015). "Like" also leads Hot R&B Songs for an 18th week. To get the complete run down of the UK Top 40 Singles Chart this week before the next 1800 GMT Chart Show Friday 23rd June updates the chart, click here. I hope you've enjoyed my very first Chart review. Catch up with you again when I review the next Chart rundown. 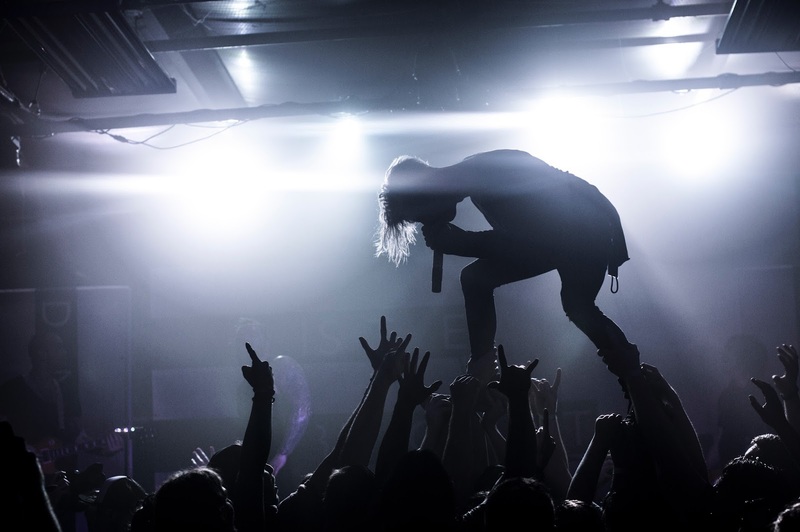 Gone are the days when the music industry generated most of its revenue from record sales. The advent of the mp3 download brought about a gradual decline in physical product sales, namely, vinyl—currently going into revival, how times have changed—and the CD; which meant that more and more artists had to rely on touring and merchandising t-shirt, caps, and so forth, to generate the much needed revenue to sustain and grow their brands. This article will investigate the plight of the musician and that of the small business owner, in connection with creating supplemental income streams in a rapidly evolving retail marketplace. Figuring it all out is quite a conundrum in itself, and so I’m going to cut to the chase to help you understand this in the quickest way possible. Ideally, this article is meant to help you get started with creating your very own supplemental income stream using other peoples’ platforms (that's the smart thing about it); and harnessing the immense prowess and savvy of experienced marketers at no cost to you. Yes, the best things in life are free. Believe or not. Let’s assume you’re a musician, or small business owner who wants to find a fast way to get your physical products online (t-shirts, baseball caps, scarves, trainers, head bands, bracelets etc. ), the thought of hiring a web designer to create a webpage for you can be quite daunting when you consider the cost implication, not to mention setting up an online shopping cart on YOUR platform to take orders. And we haven’t even touched on the marketing aspect. If you’re under the impression that when you build, they’ll come, then you’re in for a big surprise: it doesn’t work that way. Now, what if I told you that you can have a superb online store, complete with shopping cart, and that on top of it… a team of online AND offline marketers to promote your products 365 days a year at absolutely no cost to you, would you be interested? Well, to be quite honest, I thought as much. Sounds too good to be true, but here’s how it can work for you! First and foremost, you register yourself as an affiliate marketer with one of the world’s largest affiliate marketing platforms, SFI Marketing Group. They have over one hundred thousand active affiliates on their network. This is the sales force that will push your products across the internet and furthermore, into retail outlets on the high street. But most importantly, the reason I recommend you join the affiliate network yourself is because, using this system—if you are a musician, fashion designer, artist or small business owner especially—you’ll be well placed to then incentivize your fans and followers to take on the task of promoting your products. Because it stands to generate a supplemental income for THEM. They'll love you for it! Once you’ve become an affiliate, you can then—through your back office, register as an E-Commerce Associate to upload the products you want to sell. I could’ve asked you to go directly in as ECA, but you stand to gain so much more by also becoming an affiliate. So many ECAs are also affiliates. Soon enough you’ll come to realize that in network marketing, perhaps the most challenging part is in GROWING your organization—those that join the program under you. But when that is taken care of for you with the Builder Bundle auto-delivery system for the cost $1.81 a day (the price of a cup of coffee), and you don’t even have to work to build a downline—as the system does it for you, then you have every reason to get stuck right in. So, do make sure you sign-up for the Builder Bundle once you come aboard. You’ll save yourself a bundle of time and energy in building your business… so you can focus on the more fun things. To get started straight away, click here!